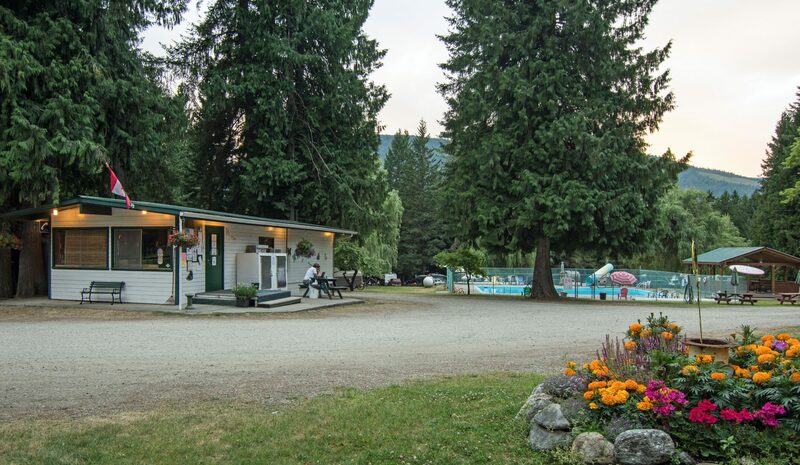 Welcome to Whispering Pines – Family Camping at its Best! ARRIVAL / DEPARTURE: Check IN is 1:00 PM to 8:00 pm (for safety reasons we do not allow check ins after dark). Check-OUT is 11:00 AM. If you wish to stay an extra night, please check with the office before 10:00 AM. Campers still occupying sites after the 11:00 AM check-out time will be asked to pay for another night. SPEED: The speed limit is 10km/hour throughout the park. CHILDREN ARE PLAYING THROUGHOUT THE PLAYGROUND – GO SLOW! FREE-RANGE CHILDREN: We encourage imaginative child’s play, and parents or guardians are liable and responsible for the acts and conduct of their children. Children under 14 should be accompanied and supervised by an adult at the pool, playgrounds, mini-putt and other areas of the park. QUIET TIME: 11:00 pm to 8:00am is quiet time. SMOKING: No smoking in the park except your campsite. There is a $25/occurrence fine that will be implemented. MUSIC: Keep it respectful and it’s all at the discretion of the management. GENERATORS: No generators. At discretion by manager may be allowed if urgent or emergency. PETS: We love pets. They must be on a leash (6’ maximum) at all times. You must pick up after your pets (if we have to pick it up – it’ll cost you $25). Pets are not allowed at the pool, or in other RV sites, or mini-putt. POOL: There is no lifeguard on duty. Children must have adult supervision at the pool at ALL times. NO FOOD or DRINK is allowed in the pool area. Swim at your own risk. GUESTS: $5 per person fee. All guests and visitors must report to the office upon arrival to pay and obtain a parking pass and assigned parking space. Guests must leave before 11 PM. Registered guests are responsible for the conduct of their visitors while in the park. Whispering Pines will NOT be responsible for any accidents or injuries while your visitors are on the premises. SEPTIC: YOU MUST USE A SEWER CONNECTOR. Please DO NOT FLUSH anything down the toilets (including toilets in your RV) except TOILET PAPER. We are on a septic system and it will block and back up!! Do not put grease/cooking oil down your drains either as this will block the system. Please put grease in a container and put in the garbage bins. Service calls will be billed at $80/hour. COMMUNAL FIRE PIT: Wood is provided by Whispering Pines and may be found adjacent to the office (not the bundled wood). The last person at the fire pit must make sure it is out (pour water, stir, pour again). FIRE PITS: Individual wood fires are allowed at designated fire pits only. You must ensure that your fires are out before you retire for the night. Propane fire pits are allowed. GARBAGE / RETURNABLES: Please dispose of your refuse at the large waste bin area and please separate your deposit bottles and place in the bins provided. Campers are asked to make sure that their site is kept tidy and clear of garbage. Please respect your neighbours and refrain from walking through their site. Please tidy up after yourself in the showers and toilets (REMEMBER TO FLUSH). Limited your shower time to under 8 minutes to allow hot water for others. Please park your vehicle in a way that allows access for other campers. Please make arrangements with the management to park your boats at the boat storage. Mini-Putt, horseshoes, etc. are free, please return items to the office when finished playing so that others may use them. LOST & FOUND: Please report any losses at the office. We have a lost and found box at the office. Please report any problems to the office. We are here to assist. Thank you, your cooperation is greatly appreciated. We hope you enjoy your stay and will come again.